It turns out Bigfoot is as big and blurry as he looks in photos. Frankly, it is probably smart not to show too much of your monster, too soon. Of course, if anyone knows their way around a found footage horror film it is Blair Witch and VHS2 co-director Eduardo Sánchez. An annoying camera geek will naturally have the tools to document the mayhem when a group of friends get on Sasquatch’s bad side in Sánchez’s Exists (trailer here), which opens this Friday in New York. For some reason, Uncle Bob stopped going to his rustic hunting cabin, so his nephews Matt and Brian had to steal the keys for a weekend getaway. Convinced it will be Shangri-La up there, they drag along Matt’s girlfriend, their pal Todd, and his girlfriend. Actually, their friends are more Matt’s than Brian’s. Matt is the brooding, popular brother, while Brian is the goofy one who hopes to post a Bigfoot video on youtube. Oh, he’ll have some footage alright. However, he was asleep when their car hit some sort of mysterious furry object. No, whatever it was, it was not a deer. The state of Uncle Bob’s cabin is also a bit of a buzz kill. It sure looks like he left in a hurry. Nevertheless, the five not-as-young-as-they-act partiers start drinking and getting on each other’s nerves before Bigfoot basically lays siege to the joint. Unfortunately, ‘Quatch is probably the smartest character in the film. To be fair, Chris Osborn is not bad as Brian, nibbling on the scenery here and there. In contrast, the rest of the ensemble is so nondescript viewers will hardly remember them from scene to scene. Still, the Sasquatch could serve as a highly credible Wookie audition for big and athletic Brian Steele. 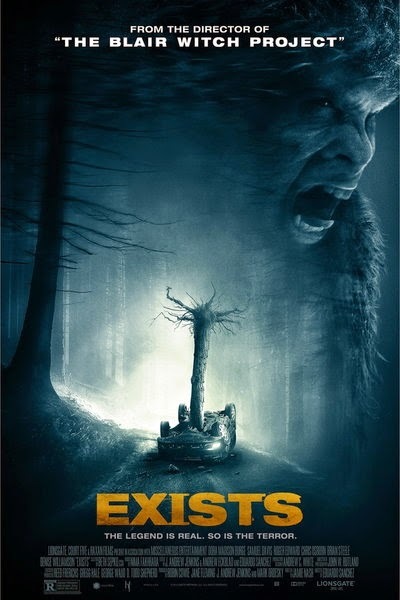 Exists is like the Busch Beer of horror movies. If you want to sit back and savor a drink, there are much more refined options, but if you just want to get hammered, it will get the job done. We have seen found footage of plenty other cabins in the woods, but Sánchez has a strong command of the genre mechanics. Shrewdly, he keeps the big harry one under wraps in the early going, framing some rather effective what-did-we-just-see-out-of-the-corner-of-our-eyes shots. Even if it does not break any new genre ground, Exists is a lean and brisk foray into the dark woods, thanks to Mike Elizalde’s creature design, Andrew Eckblad and Andy Jenkins’ tight editing, and Sánchez’s willingness to occasionally fudge the found-footage format. There are better Halloween selections screening during Anthology Film Archives’ Industrial Terror series, but there are far worse possibilities at the multiplex. It opens this Friday (10/24) in New York at the AMC Empire.